The Digital Disruption Wave: How Can IT Firms Ride It? Cost arbitrage is the tide that lifted many boats, large and small. In turn, that brought advantages of scale, given the vast talent pool that was readily available. Add well-defined process to the mix, and you had a well-oiled engine that could execute with predictability time and again, giving rise to the factory model of software delivery. In fact, this is the bedrock on which the industry has thrived over the past few decades. With digital disruption, the twin advantages of scale and cost have lost merit and shaken the foundation of the industry. Indian technology firms are now caught in the middle,with scale not providing the competitive advantage it once did and price leverage no longer a comparative advantage. How can service providers thrive and survive in the digital paradigm? In the digital era, differentiation comes from providing vision for building products and platforms that can be leveraged as IP by the customer and complementing them with the right technical skills. Validating the vision may require multiple iterations and learning from each to refine the vision further. In this cycle, “failure is an option” because the team is hypothesising multiple scenarios that may resonate with the end customer. It may also require evangelising to some extent so customers can begin to see potential benefits. Does the industry have these skills? They certainly cannot train their workforce in these new-age skills. Building technical skills by training/retraining the workforce is not new to the industry. They have perfected this art, having trained people in droves—from the Y2K days requiring Mainframe skills to the internet era when organizations started migrating their applications to the web. However, developing people who can envision the future state, hypothesize, try, and possibly fail many times…is farfetched. Unlike technical skills, these skills are difficult to impart. Hence, some industry players are taking the inorganic route and others are taking the network route by collaborating with start-ups. Whichever strategy wins, the writing on the wall is clear. Indian IT firms have to revamp their business model if they are to thrive and survive in the digital era. Michael Porter wrote the seminal book on strategy called Competitive Strategy. Strategy is a seemingly murky, amorphous, intangible concept, but Porter brilliantly prescribes the five questions strategy should answer. What are the answers for your business? What is your distinctive value proposition? This distinctive value proposition is comprised of three key parts. Which customers will you serve? Which needs of those customers will you fulfill better than the competition? How will you position and price your proposition (premium/commodity)? For example, Amazon’s consumer value proposition is simple: the largest selection at the best prices delivered fastest to all internet consumers in the U.S.
How do you tailor the value chain to suit your company? The essence of strategy and competitive advantage lies in the internal activities of the firm and choosing to perform activities differently or to perform activities that differ from those of rivals. This is what Porter means by tailoring the value chain to suit your company’s strategy: picking the internal activities that will differentiate it. Amazon has focused on building the best supply chain, optimizing logistics and operations, to deliver the customer experience they value. What trade-offs do your business offer to differentiate itself from competitors? Every strategy has a trade-off. Do you provide speed of execution vs. market share? Almost all businesses initially limit their scope of services to enable them to finetune their value proposition. For example, in the beginning, Amazon sold only books, only online. How strong is the value proposition across the value chain? Do the new value proposition and trade-offs made within the businesses operations suddenly create new market opportunity and competitive advantage? How does your strategy endure over time? If market conditions change, does your strategy survive? Amazon’s strategy of shielding customers from looking elsewhere is by promising them three things they would always want: more, faster, cheaper. Those three truths aren’t changing anytime soon. Today, every new technology and event is categorized as “disruptive.” Almost every start up worth its salt aims to disrupt existing industry structure. While it may be acceptable to use the term “disruption” liberally, the purpose of my article is to draw the line that distinguishes disruption from dislocation. Disruption almost always results in a new business model in established industries. The result is that it upends incumbents, forcing them to recast their business strategy to remain a viable competitor in the industry. For instance, Airbnb and Uber/Ola brought the aggregation business model into an industry not used to such concepts. This disruption to the business model resulted in incumbents either copying the model of the disruptor or pleading with the government to level the playing field to stay competitive. With disruption to business models facing almost every industry, organizations are focusing on making digital strategy their centerpiece. Going “digital” requires a coherent approach to ensure all parts of the organization follow the digital approach and the organization is perceived as being digitally savvy. How can organizations be sure their strategy is coherent? Porter’s model offers a good starting point. 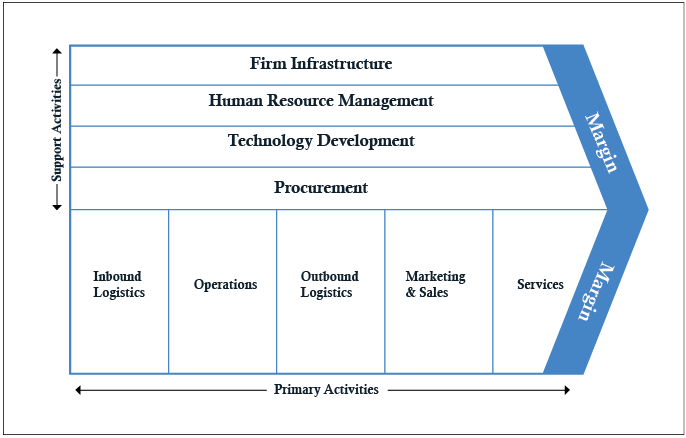 In the colloquial approach, the organization marshals its unique set of activities to help deliver a value proposition to the customer. In the process, the organization either focuses on competitive or comparative advantages to deliver the product or service at a profit. This represents an “inside-out” approach that served industries well until now. In the digital imperative, customer expectations are high and they are spoilt for choice, so the earlier, “inside out” needs to be transformed into an “outside-in” approach. Customer expectations now become the “driver,” so organizations need to marshal their internal activities to meet this strategic imperative of profitably serving the customer, knowing their high expectations. Organizations need to ensure that their digital strategy is holistic by ensuring each and every part interacts seamlessly with the customer. For example, for recruitment to engage with candidates seamlessly from interview to offer, the IT infrastructure needs to support this process reliably, so candidates experience the least amount of friction necessary in the entire process. Similarly, for Finance to handle vendor payments transparently and accurately in a time-bound manner, it should be easy enough for vendors to upload their invoices electronically and view the status from submission through payment. For customers to have a seamless, Omni-channel buying experience, the marketing, sales, and logistics departments should interact “digitally” to ensure a superlative customer experience. In short, for an organization to be truly digital and perceived as digitally savvy, all touchpoints in the organization’s internal value chain should be able to interact “digitally,” so they are well positioned to deliver a truly digital experience to all their customers!